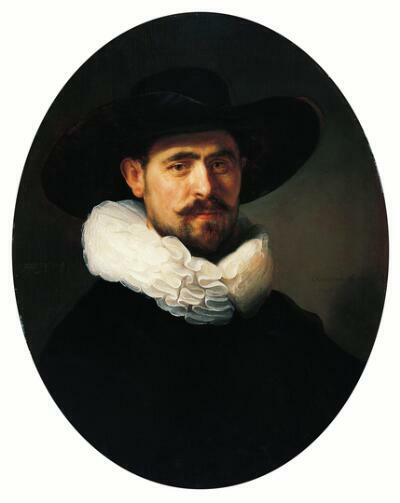 The man portrayed here is believed to be Pieter Sijen, a merchant who was a member of the Mennonite congregation in Amsterdam. An inscription at the left informs us that he was 41 years of age at the time of this portrait. Rembrandt painted a companion portrait of the man’s wife, Marretje Cornelisdr. van Grotewal, that is now in the collection of the Speed Art Museum in Louisville, Kentucky. The sitter as depicted embodies sobriety and modesty, values that were important to the middle class in Amsterdam. Yet Rembrandt transforms what could be an austere first impression—given the limitations of the formal black attire that was fashionable at the time—into a warm and insightful portrait. The vivid description of the man’s features, the warm, directional light, and the marvelous brushwork impart a sense of animation that earned Rembrandt a position as one of the most sought-after portraitists in Holland during the 1630s. Baron H. Thyssen-Bornemisza, Lugano, until after 1971. Rembrandt knew—as few artists before or since—how to convey the sheer visual excitement of forms emerging from darkness. That’s one of the reasons this portrait is so arresting. Although the sitter seems quite still, Rembrandt creates a keen sense of movement with the meandering lines of his layered ruff and in the flowing silhouette of his broad brimmed hat. Gazing out, the man seems to have just turned into the light. It flows across his face, illuminating one side with precision—the other is more subtly modeled by shadow. Notice how the brushwork is more visible as Rembrandt describes variations in flesh tone, or the character lines around the eyes. Rembrandt was still in his twenties when he painted this picture. As he matured, his explorations of light, shadow and the human face would become even more insightful and complex. While we are not certain, this painting may depict the 41-year-old Pieter Sijen, a wealthy linen merchant who lived in Amsterdam. A painting of this sitter’s wife, Marretje, now hangs in the J. B. Speed Museum in Louisville. Both portraits once hung together until 1960, when they were sold to two separate buyers at an auction.